I don’t know if this is possible, but I just want Vanderpump Rules to last forever. This is one show that has never gone stale. Season after season, the SURvers deliver premium content. Will they be able to keep this up? Jax Taylor is always someone we can count on for an entertaining storyline. He has kept this show interesting since Season 1. Now he has a great idea for the future storylines. Long gone are the days of single Jax and love triangles. Now he is engaged to Brittany Cartwright, i.e. wedding planning is bound to be a major part of next season. That is unless they save all of that for a spin-off series. Nevertheless, a wedding is clearly on his mind, but so are babies. Yes, you read that right. Jax is ready to be a dad and he wants Tom Schwartz and Katie Maloney to join him and Brittany on that journey to parenthood. Wow. Just imagine all of the normal Vanderpump Rules hijinks with a joint baby shower thrown into the mix. If this show really goes on forever like I want it to, there could even be dueling birthday parties among the Vanderpump spawn. My real dream come true would be the eventual series Vanderpump Rules: The Next Generation, with all of their kids “working” at SUR and feuding over sponsored social media posts. TELL US- DO YOU THINK JAX, TOM, KATIE, AND BRITTANY ARE READY TO BE PARENTS? 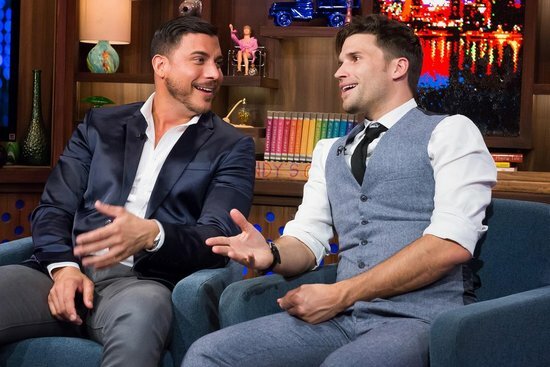 DO YOU WANT TO SEE THEM HAVING KIDS ON FUTURE SEASONS OF VANDERPUMP RULES?